I absolutely love brownies. On more occasions than I would like to admit I have eaten an entire batch all by myself. There is something so perfect about chocolatey brownies right out of the oven. Since my oldest son is home from school for the summer I have been baking up a storm. Both of my boys are in major growth spurts and have been eating everything in sight. So I was very grateful when friend gave my 15 pounds of yellow squash a couple of weeks back. After canning, making cake and yellow squash chocolate chip cookies I was still left with pounds of yellow squash. So I thought long and hard about what to bake and came up with the notion of baking brownies. I browsed around the internet until I found a recipe for Squash Brownies, which looked easy and a perfect solution for my squash abundance. This recipe has 16 ingredients. It takes 30 minutes of total time and makes 20 servings. I made a few modifications to this recipe. Most importantly instead of using oil or butter I substituted unsweetened applesauce. I substitute exact amounts when using applesauce. This recipe would also work and have a richer flavor if you substituted 1/2 cup of applesauce and still used the 1/2 cup of butter. When using applesauce the baking time is always increased. On average my baking times increases 5-15 minutes. I normally check my baked goods frequently to make sure that they are baking correctly and pull them out as soon as they are done. I chose to leave out the nuts, my two boys are not fan of brownies with nuts and will normally turn up their noses. Most importantly with this recipe make sure to adequately get all the liquid out of the squash. I place the shredded squash in-between a layer of paper towels and squeeze it over my sink. There will be a very large amount of water, keep squeezing until no additional water comes out. 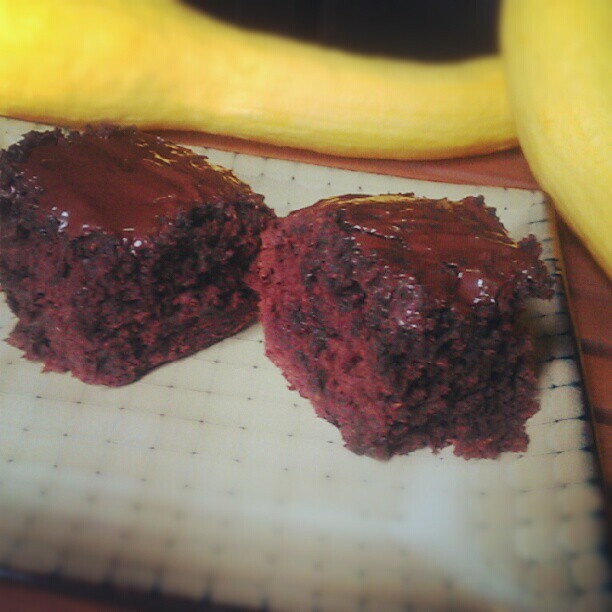 My two boys loved this recipe and had no idea that they were eating brownies made with squash. 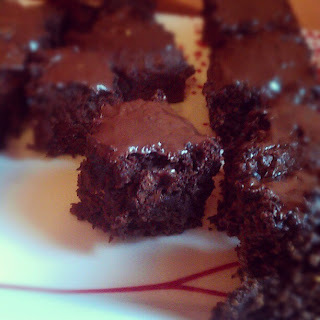 I loved how the brownies were still very cake like even though I substituted applesauce. Spreading the top with chocolate after they were baked made for a delicious and easy frosting. This recipe was a great way to use my overabundance of squash and would also work very well with zucchini or pattypan squash. For the recipe go to Squash Brownies. I love your blog! I am your newest follower. I found you on Friends Following Friends. I will be returning. Please follow me in return. Frugal Foodie is awesome! I am always looking for recipes. Hello there!! :) I am so excited to find another food blogger in WV! :) I would love to know where you are in WV. I live in the North Central area. Hello from Wheeling! Giving your yellow squash brownies a try since I have an abundance!